The 10 Best Pumpkin Picking Spots in Utah! Picking pumpkins in fall is almost like a rite of passage—if you do it, your fall is somehow twice as magical, and if you don’t, you feel like you’ve missed out on vital fall festivities. From Cornbelly’s to Beck Family Farms, options abound in Utah. 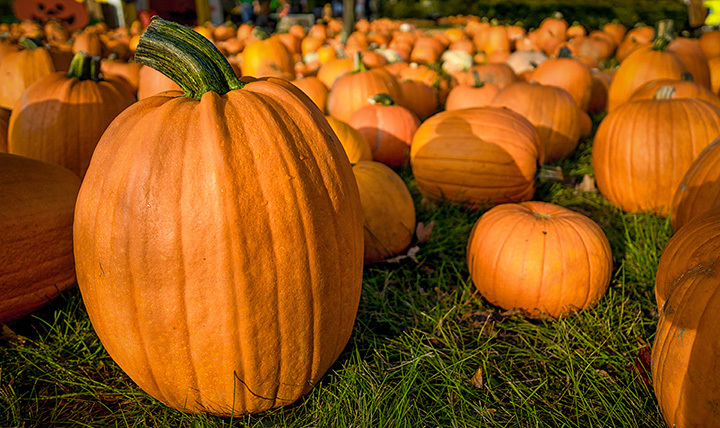 Here are the 10 best places for pumpkins in the state! If you’re from Utah and love fall, it’s likely you have heard of Cornbelly’s. For many, the annual month-long celebration is a family tradition. Along with a corn maze, a haunted house, fall-themed games and performances, and plenty of tempting treats (including caramel apples, funnel cakes, and turkey legs), Cornbelly’s also has a large pumpkin patch. Compared to the exciting grandeur of crowded Cornbelly’s, Black Island Farms feels quaint. But of course, this is part of the farm’s appeal. In addition to a 16-acre corn maze, a haunted corn maze, and a courtyard with various activities for children, Black Island Farms offers hayrides out to one its pumpkin patches where you can find the carving canvas of your dreams. Conveniently located about 15 minutes south of downtown Salt Lake City, Wheeler Historic Farm is a year-round hotspot for family fun. During the month of October, the farm hosts its annual “Pumpkin Days,” which includes a pumpkin patch, a hay maze, a cow train, and wagon rides. The festivity’s admission fee includes a pumpkin for every group member. A popular fall destination in Utah County, Hee Haw Farms is an affordable (general admission to the farm is only $6 for ages three and older) way to get your family’s fall fix. One general admission ticket includes pumpkin picking, hayrides, access to the petting farm, the giant slide, the animal train, the corn box, and more. Be sure to keep an eye on their calendar. In October, Hee Haw Farms holds their annual “Giant Pumpkin Drop.” You won’t want to miss out! A fifth-generation family farm, Petersen Family Farm is 100 percent Instagram worthy. What part of the farm isn’t picture perfect? It’s hard to say. But even considering the farm’s beautiful peaches, kid’s summer camp, and yellow watermelons, its pumpkin patch is probably Petersen Family Farms at its most picturesque. Pick your favorite pumpkins and gourds, buy some sweet treats, and get your little ones’ faces painted. Simple and straightforward, the Crazy Corn Maze in West Jordan is pretty much exactly what it sounds like: a big corn maze. If you want to get spooked, there is also a “Night Stalkers Haunted Trail” and of course, a pumpkin patch. A four-acre plot of land dotted with pumpkins, the patch is popular, so the earlier you visit in October, the better. In the business for more than 30 years, Beck Family Farms supplies pumpkins to over 100 grocery stores in Utah and Nevada. Its farmers market is legendary, but its pumpkin patch is even more so. Whatever kind of pumpkin or gourd you are looking for, you will find it here. Pack Farms specializes in three things: hay, sod, and pumpkins. The farm grows over 20 acres of pumpkins and several squash varieties each year. At Pack Farms, you’ll find massive pumpkins, but also hand-sized pumpkins that make for great decorations. Visiting Pack Farms is a scenic, quintessentially festive experience that is fun for all ages. Water Hollow Ranch is a rural farm with myriad attractions throughout the year, but perhaps unsurprisingly, its most popular attractions are during the fall season. With a haunted corn maze, a normal corn maze, a farm playground, and a pumpkin patch, both children and adults will enjoy this charming farm. To pick pumpkins, visitors take a ride on the “Pumpkin Wagon” straight to a large pumpkin patch that features plenty of different pumpkin varieties. Pumpkin Point Farms keeps it simple with their quaint pumpkin patch (featuring 35 varieties) and two wonderful corn mazes. But that’s the best thing about Pumpkin Point Farms: the pumpkin patch really is the star of the show. With the purchase of a pumpkin (which range from $1 to $15) the corn maze is free! And your little one will have a blast sitting on one of their tractors.